SaltStack today announced it will launch the SaltStack Certified Engineer program at SaltConf 2014. SaltStack will launch the SaltStack Certified Engineer program at SaltConf. SaltStack, the full software stack for configuration management, private cloud building, public cloud orchestration and autonomic infrastructure, today announced it will launch the SaltStack Certified Engineer program at SaltConf 2014. Certification exams will be made available on site at SaltConf exclusively to pre-conference training attendees and to experts who have previously taken SaltStack regional or on-site training courses. The SSCE exam will be included in the price of SaltConf registration. 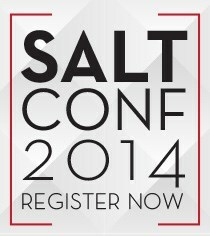 SaltConf, the SaltStack user conference, will be held in Salt Lake City from Jan. 28-30, 2014. The pre-conference training has limited space, is available for $350 to registered SaltConf attendees, and is expected to sell out. Register now at http://www.saltconf.com to reserve a conference pass and a seat in SaltConf pre-conference training and to become one of the first to achieve SaltStack Certified Engineer status. The SaltConf agenda is designed to provide knowledge and training to help attendees automate the data center better and faster than ever before through the power of the SaltStack automation platform. Some of the best and brightest in cloud building and Web-scale automation will speak and attend this three-day conference. SaltConf content will be delivered by SaltStack core engineers, developers, customers and users from organizations like LinkedIn, Wikimedia, VMware, Mulesoft, HP Cloud and many more. Content will include SaltStack hands-on labs and training, and talks delivered by people who excel at building and managing enterprise infrastructure and application stacks using SaltStack software. SaltConf will also offer many opportunities to hack and network with the SaltStack community. SaltStack is a complete systems management software platform for fast and scalable automation of any cloud, application stack or data center infrastructure. Specifically, SaltStack is used by system administrators and developers to automate configuration management, private cloud building, public cloud orchestration and autonomic infrastructure. The Salt open source project was launched in February of 2011 and is now one of the fastest-growing, most-active communities in the world. SaltStack was founded in August 2012 to support the Salt project and to deliver SaltStack Enterprise packaged for the world's most-dynamic large and small businesses, web-scale applications and clouds. SaltStack won an InfoWorld Bossie Award 2013 in the category of data center and cloud software, won the 2013 GigaOm Structure LaunchPad competition, was named a Linux Journal Reader's Choice product in five categories including "Linux Product of the Year" and "Best New Commercial Application," was named a Gartner 2013 Cool Vendor in DevOps, and was included on the GitHub Octoverse Top 10 list for 2012. For more information, please visit SaltStack.com.